Forrester Research recently published a report indicating that the need for better analytics is needed by companies to better understand the value of search and how much of a company’s web traffic originates from search. The same report indicated that many companies separate their search marketing efforts from their regular marketing activities and according to Forrester; “brands will spend more than $33 billion on search marketing by 2016, up from $24 billion this year.” 1. Clearly the most revealing report for us here at One Big Broadcast is the report released by Experian Marketing Services mid January 2013 summarizing web trends of 2012. The report revealed that search engines are a key factor in web traffic sources. Search won the web traffic race with a staggering 49% of traffic to web sites compared to 3..8% from Facebook and 1% from YouTube.2. One would predict that as more and more people use smartphones that search will continue to the dominant factor for any marketer. It stands to reason that they would want a platform like One Big Broadcast. Our content creation and marketing platform was designed to attract search and we have spent a great deal of time developing analytics that measure performance, show results and also focus on results of effort from search. Other forms of analytic reporting shows the value of social news posts compared to the same interest from search. Business owners can quickly focus on messages that are working and enhance that space compared to days gone by when everything was guess work. As you gain knowledge from meaningful reporting and real time analysis you can make smarter decisions based on result s. For example many of our clients gain insights they would never conceive by studying reports from individual social networks. 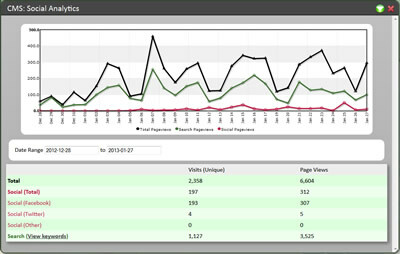 What we are doing is combining results and from different platforms and adding analysis tools. The end result allows for smart, informed and important decision making that could affect marketing spend or strategies. As we continually dig deeper into the many areas of the OneBigBroadcast content creation and marketing platform - our advenced reporting tools reveal that in many ways all things are connected. By harnessing the power to create deeper and meaningful reporting companies can make smart real time decisions based on 'what people are saying'. Contact us for a demo and let's explore ways how our integrated reporting platforms can help grow your business and gain valuable insights into how your marketing efforts are performing.